Luton Town ran out 3-1 winners at Gillingham on Saturday to move up to fourth in the League One table. Here’s how the Hatters rated on the afternoon. James Shea: 7 - Controlled his area impressively in the first half, coming off his line to make a good catch, while his well-judged throws got Luton on the front foot. Protected by his defence after the break, until beaten by Eaves’ low drive, although little came his way after. Jack Stacey: 7.5 - Not really a game where he could drive forward as much, with Luton keeping things compact defensively. Tucked in and did just that though, ensuring little threat down his side. James Justin: 7.5 - Proved that he is more than capable of reigning in his attacking instincts when needed and be part of a solid defensive display. Excellent leap meant he won his headers whenever the ball was in his vicinity. Matty Pearson (STAR MAN): 8.5 - You could tell he was absolutely relishing the direct manner in which Gills came at his team from minute one. When the hosts went even more long ball during the second period, he just sent it straight back. Sonny Bradley: 8.5 - Like Pearson, he was more often than not in the right place to clear his lines as Eaves was left with very little in terms of chances. Big factor in a back-line that’s looking incredibly secure these days. Glen Rea: 8 - Making that position at the base of the diamond his own with another terrific display. Broke up play and also helped out at the other end as well, as he won the ball back for Luton’s second goal. Pelly-Ruddock Mpanzu: 8 - Helped the Hatters control the midfield areas as he was always happy to receive the ball and get Luton moving forward. Did his work defensively in the second period when Luton kept their opponents at arms length. 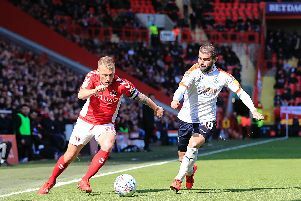 Andrew Shinnie: 8 - Surprising move when he came off for Sheehan as Luton looked to have the game by the throat. Wonderful finish for the opener as he has become a real goalscoring threat in recent weeks. Elliot Lee: 8 - Poacher’s instincts aren’t being quashed despite his place at the tip of the diamond as he was in the right place to cleverly turn home Collins’ cross. Just managed to stop celebrating in time to fire in his second from close range after Cornick hit the post too. Excellent throughout. Harry Cornick: 8 - Played his part fully in Shinnie’s opening goal as he not only started the move, but then teed up his team-mate. However, the second was something else. No catching him as he put the afterburners on and desperately unlucky not to score himself, denied by the woodwork. James Collins: 7.5 - Could consider himself very unlucky to have yet another goal chalked off for what was barely a push inside the area. Good assist for Lee’s first as he drilled it across for the striker to turn into the net. Alan Sheehan (SUB): 6 - On for Shinnie as Luton moved to a three at the back for the final stages when Gills went even longer. Aaron Jarvis: (SUB): 6 - Gave Hatters a bit more pace upfront late on. Lloyd Jones: (SUB): 6 - Added some more height as Town finished with four centre backs on the pitch.